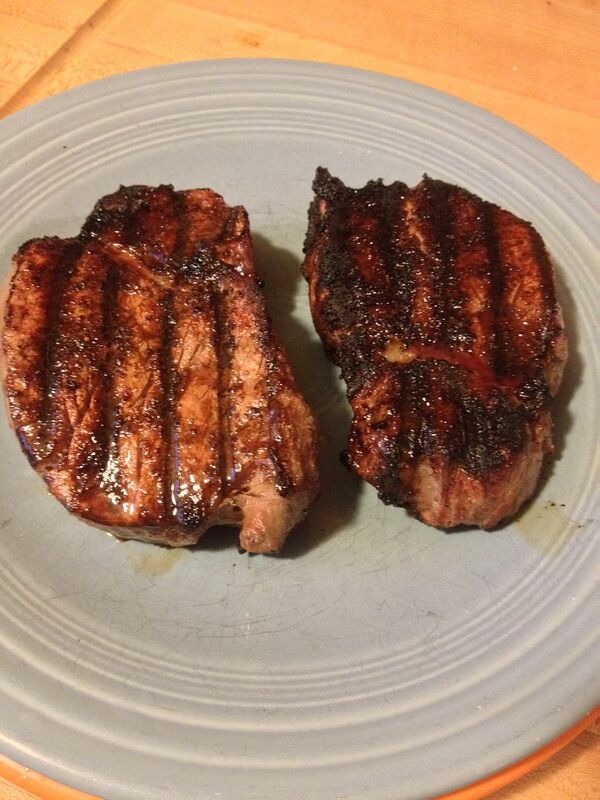 I have seen a lot of talk lately about "Cowboy Style" steaks. This is where you light your lump charcoal, and when the coals are red and ready to go, you place you meat directly on the fire to cook. Generally it is for two and a half minutes a side. Word has it that your steak comes out crispy on the outside and rare on the inside, just the way we like our steaks around here. While it sounds good in practice, I am not that you do not get ash on your steak. Wouldn't that be a little off putting? Then, I remembered an episode of Alton Brown's Good Eats where he cooked porterhouse steaks under a chimney of lit coals. Fast forward to today where, after some research, I have heard of the Jet Engine method. 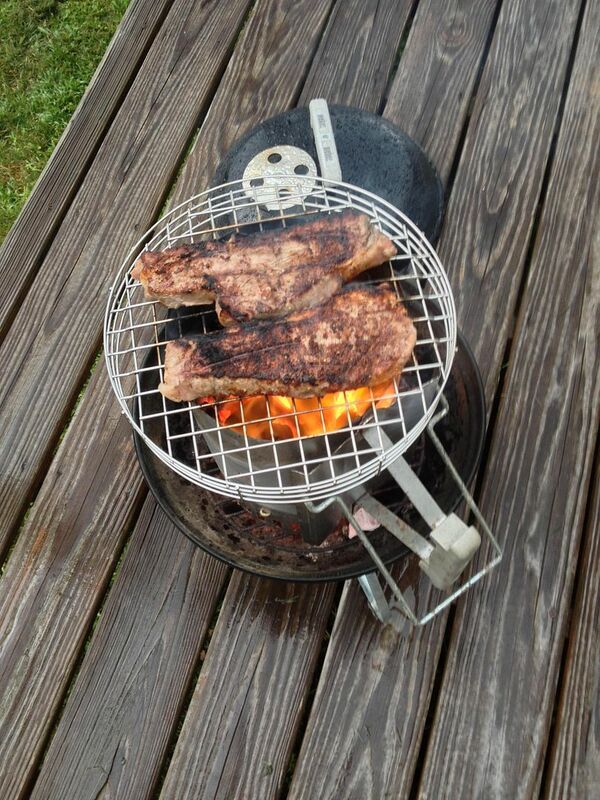 Basically, it is the Alton Brown chimney method, but you just put a grate on the top of your chimney full of lit coals, and cook your steaks for two and a half minutes a side. That, I was willing to try. So, ladies and gentlemen, please buckle your seat belts, return your tray tables and seat backs to their full and upright locked position, it is time for this flight to takeoff. Sitting in cattle class is encouraged. The first time I tried this our butcher, Dave's Country Meats, had a great deal on some beautiful beef fillet. Nice and thick, I thought there would be some leeway for mistakes and help prevent over cooking. 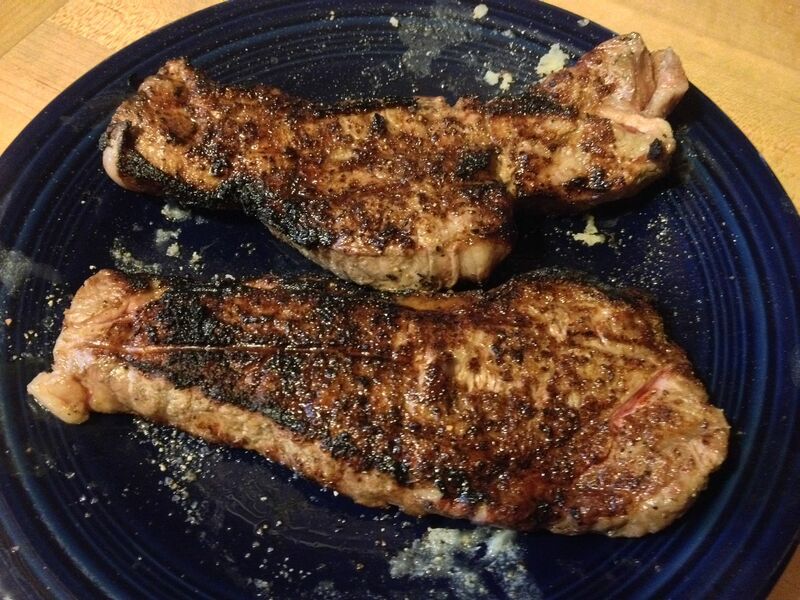 I brushed the outsides with melted butter and seasoned with granulated garlic, salt, and pepper. Then, I let the meat rest on the counter top to come to room temperature. 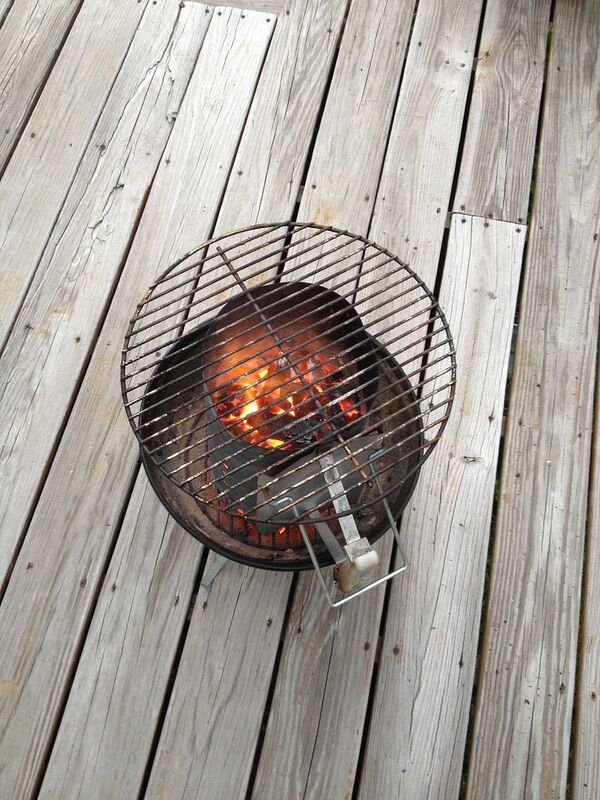 I filled the chimney full of lump charcoal, and let them get nice and hot. 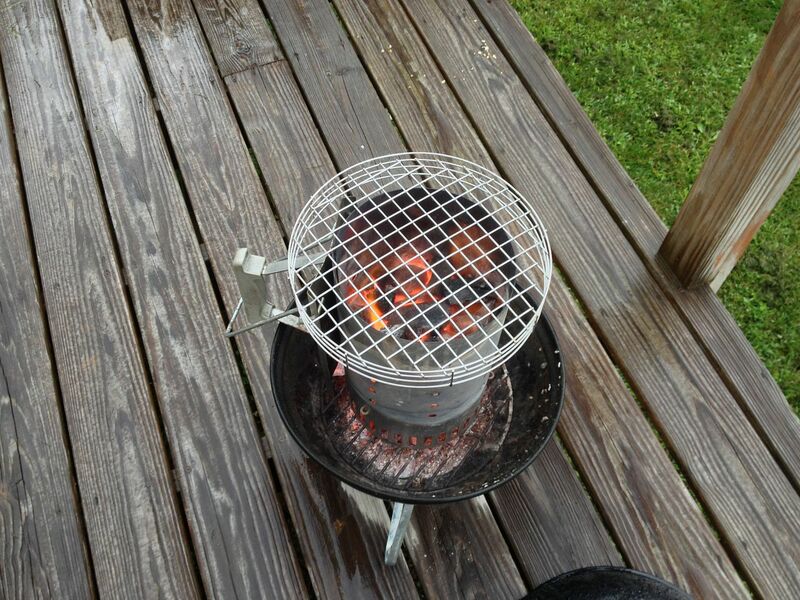 When ready, I shook the chimney to settle the coals, then placed the rack from my Smokey Joe on top to get hot as well. Then, the moment of truth. 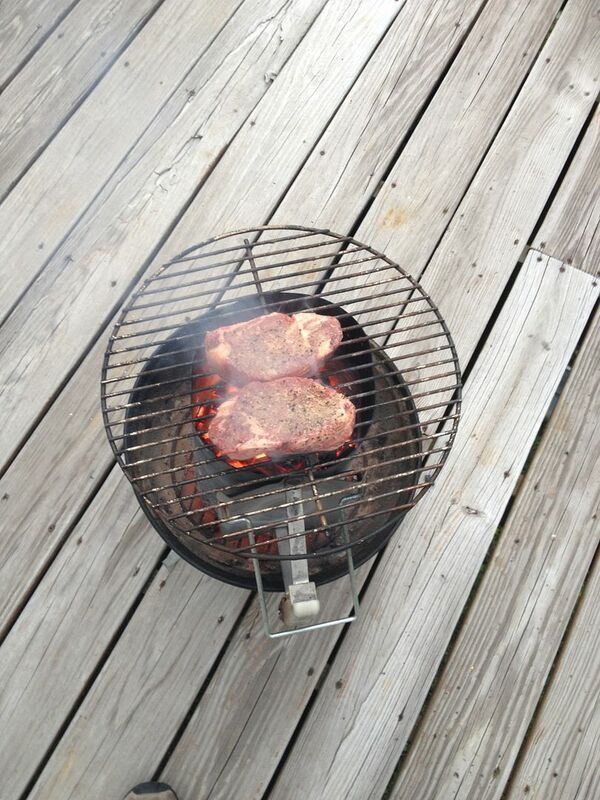 I placed the fillets on the grill. Big time sizzle. But, after two minutes, I was a bit afraid they would be undercooked. So, I decided to go three minutes a side. Here they are after the flip. When done, I brought them inside and let them rest for about five minutes, then we dug into this meaty feast. 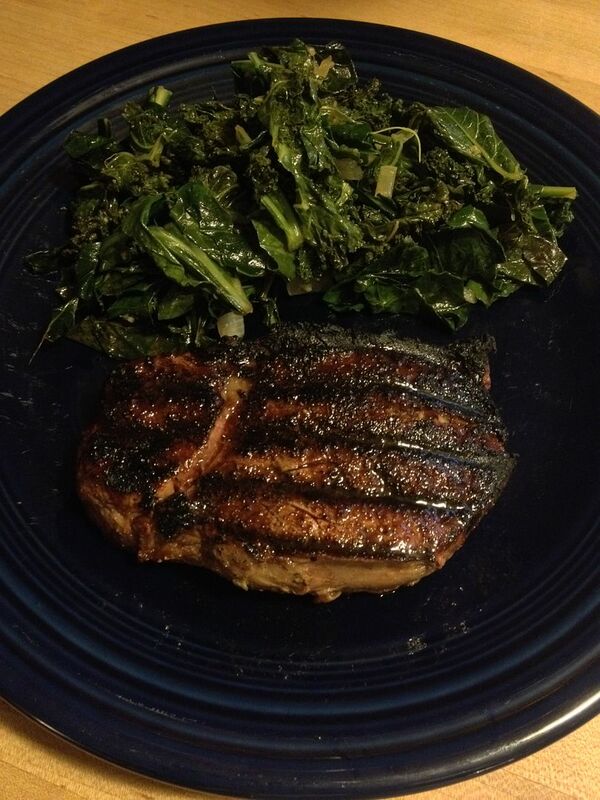 We paired with some sautéed collard greens and kale. Mine was perfect medium. A bit past what I was looking for, but still, very good. 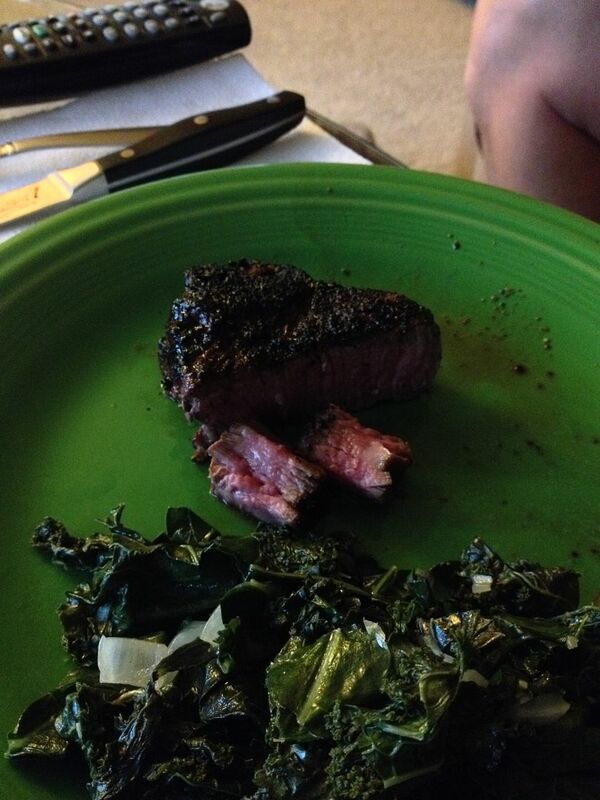 Hope's was perfect medium rare as her steak was a bit thicker than mine. Both were very good. And, all of that talk about steakhouse quality is true. You could have put that in front of me at Ruth's or Morton's and I would not have complained one bit. 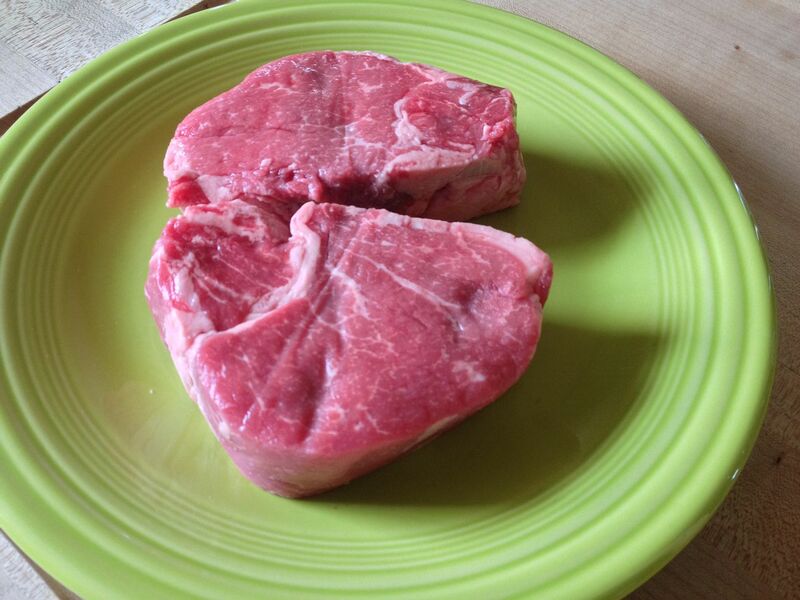 The plus is that we had steakhouse quality steaks for two for under $25. You can't do that at a mega-chain restaurant. So, after some talking in the BBQ community, I was told you have to put them on refrigerator cold. That would get you the rare cook that I was looking for. 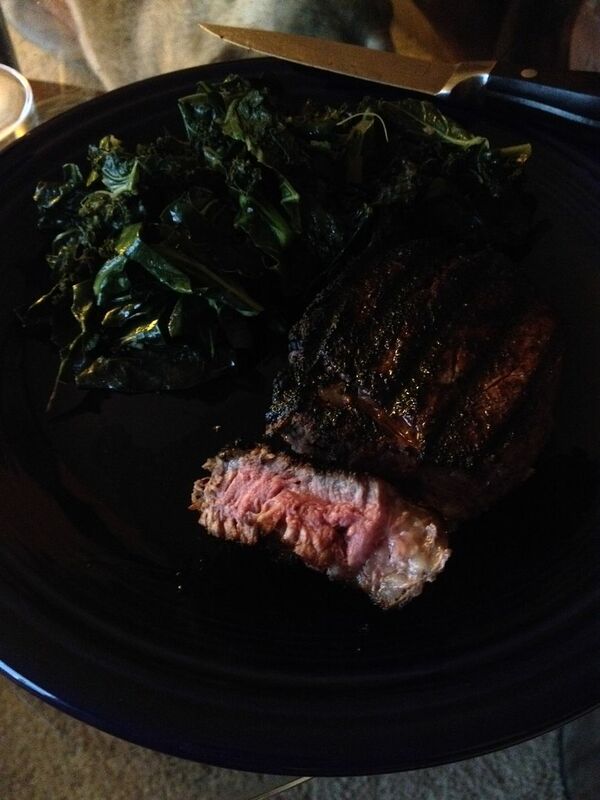 So, the steak special of this past week was NY Strips. I am ready to take this flight again. 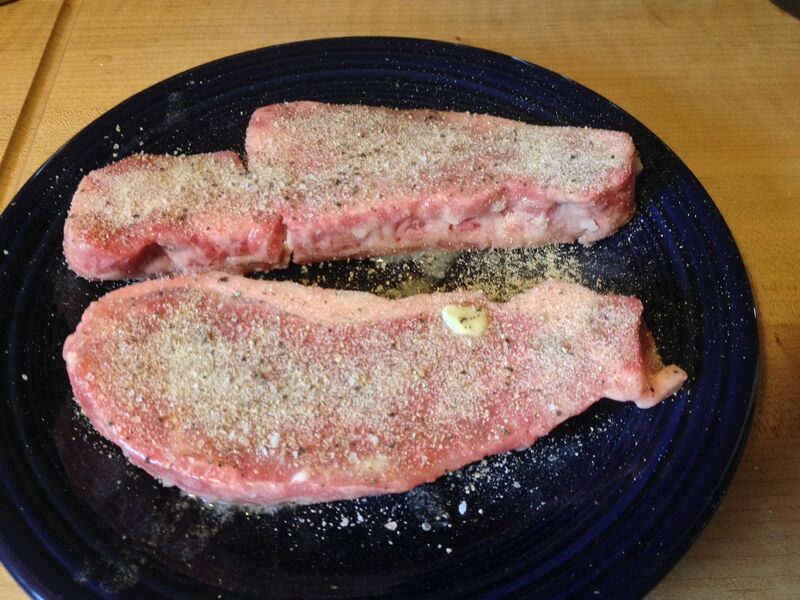 Brushed with butter, seasoned with granulated garlic, salt, and pepper, then placed the meat back in the refrigerator. Started my charcoal and placed my rack in place. 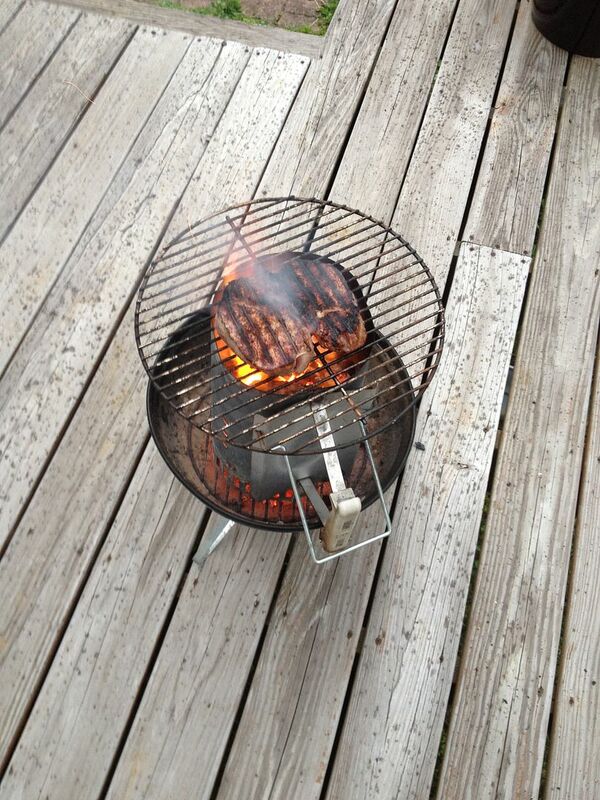 A friend of mine was even kind enough to provide me with a round grilling rack that fits nicely on my chimney starter. Since NY strips are thinner than fillet, I decided upon one and a half minutes a side and I was sticking to it, period. On the steaks went. 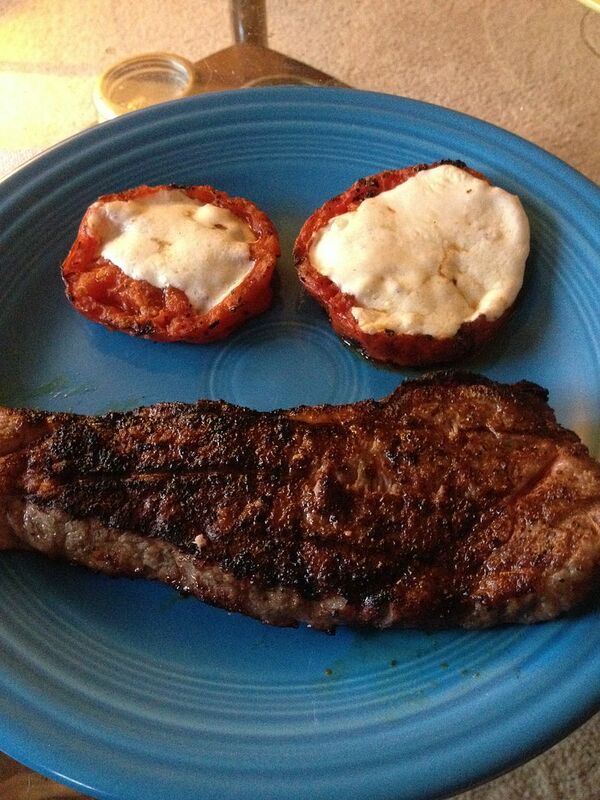 This time, we served with some grilled tomatoes topped with mozzarella cheese. It is a big meaty smile! Perfect rare. Crispy on the outside, juicy on the inside. 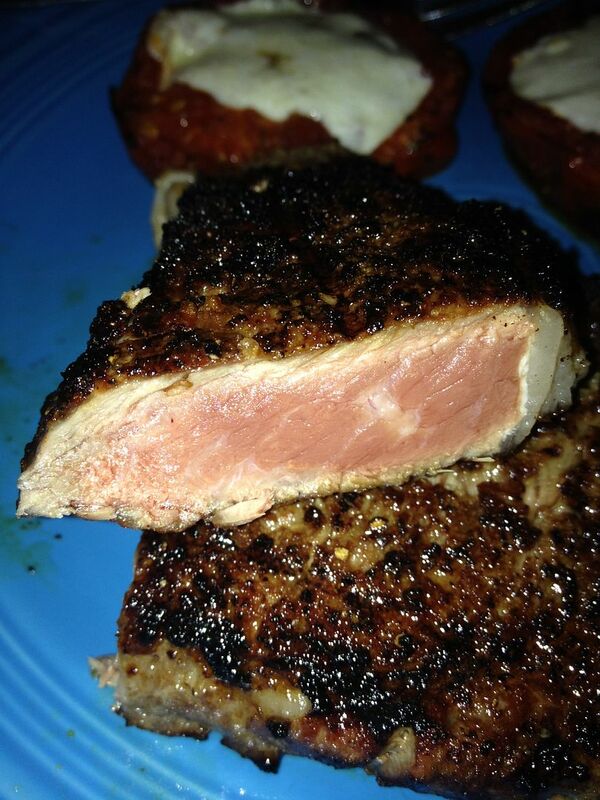 The high heat really helps to sear the outer layer of meat, locking those juices inside. 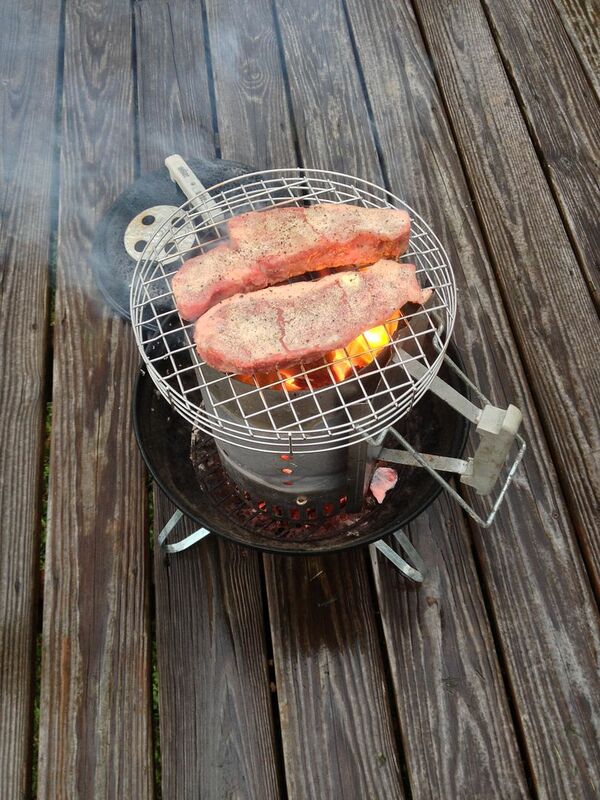 I am very happy with the "Jet Engine" method for cooking steaks. I may never cook one any other way. The Internet rumors are true, you do get steakhouse taste and quality. 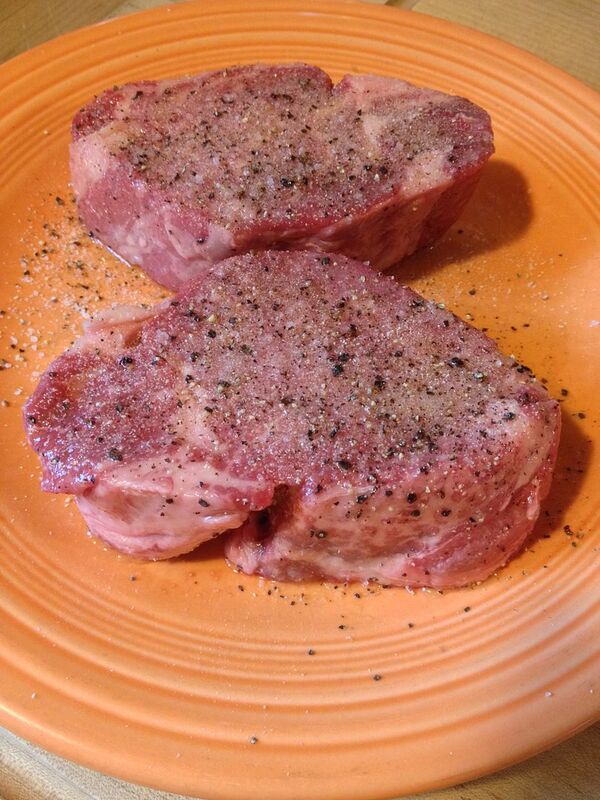 Adjust your cooking times to get the doneness that appeals to you. Now, go buy a chimney starter and some lump charcoal and enjoy your flight. Interesting... I've wanted to do that caveman/cowboy style for a while but held off for the same reasons you have, ash covered steak. Might have to give the jet engine a go instead - the name is way more awesome as well! Chilebrown, on your recommendation, I just might give the Caveman Method a try. I will just try on a cheaper cut. Gus, are you in?